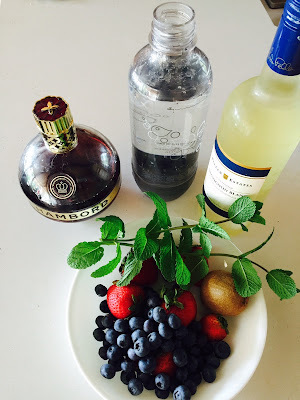 In honour of the summer of homemade happy hour, I humbly present my first concoction, a refreshing berry mint sangria. Light, refreshing and so very tasty! 1- Chop the strawberries and place all berries into a jug. 3- Add wine and set aside in fridge. 4- When ready to serve, add soda, ice and mint. 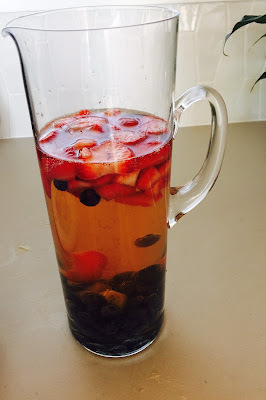 ( i find this recipe to be a good one to mix and match-- different options for fruit like citrus or berries, different liquers, and your choice of wines and sodas depending on your personal preference. Linking up with Annie and Amanda. Is it to early to mix one of these up? Yes? No? It looks SO good and SO summery too. Yum!! I love the addition of mint! Right up my alley - YUM! This looks so refreshing! I love anything with mint in it! Oh my gosh, this looks SO amazing! I love anything and everything with mint! 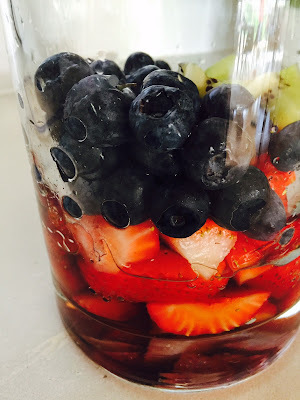 Sangria is my all time favorite summer drink and YES to homemade happy hours. We do that quite regularly here. I'll be saving this recipe for sure! Thanks for bringing your masterpiece to my party this week. Sangria is the perfect summer drink! I haven't tried chambord before but I will look for it next time we are in the LCBO! I looove sangria, such a fun bubbly fruity drink. Yummm! Pinning for when I'm not pregnant! 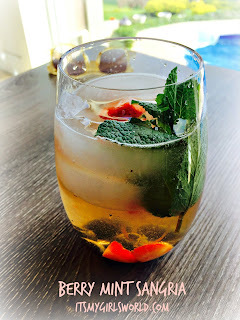 Sangria is the best and I bet it's even better with mint leaves!! Thanks for linking up! This sounds so refreshing! Ive been looking for some good summer beverages, thank you! Kids behind the blog- Dad!